Polis Chrysochous is on the northwest corner of the Island of Cyprus about 30 km north of Paphos. The districts northern area is dominated by Chrysochous Bay with its coastal blend of coves and points, beaches, tiny isles and the Akamas Peninsula. The peninsula contains a rocky national park that is known for the Baths of Aphrodite near Polis, a protected loggerhead turtle sanctuary and a diverse flora and fauna. Polis is 45 minutes from the smaller Paphos Airport or less than 2 hours from the larger Larnaka Airport. Polis is a very different to town from Paphos with its fast food restaurants and countless tourist shops. Polis – meaning town in Greek - is a quiet tourist resort area whose populace often pursue agriculture and fishing to supplement their incomes. Polis and nearby attractions can provide a restful and tranquil vacation in a pleasant and friendly environment. The region experiences mild winters, sun filled summers and sandy beaches rising from particularly warm and clear Mediterranean Sea. If rest is not your forte, Polis offers hiking, cycling, horse riding, golf and water sports. Accommodations in the Polis area include luxury hotels for the demanding guest, thematic hotels providing local color, picturesque tourist villages, hotel apartments, villas with private pools or simple family units. For outdoor types, the 'Polis Camping Site' provides camping in a eucalyptus grove nearby the sea. Polis is a pedestrian town. Visitors should walk the town to observe the old traditional buildings in Classical Revival and traditional styles often with beautiful wooden balconies. Restored stone buildings in the center of Polis set off a picturesque pedestrian area. Drawn by the cafes, bars and restaurants locals and tourists gather on the paved square from morning until night. Adorned with wall - paintings dating from the 16th Century, The Church of Agios Andronikos is located near the square. The Archaeological Museum contains exhibits of artifacts from the Ancient Marion and Byzantine history of Cyprus. Polis even boasts active archaeological sites. The Municipal Beach and the Limnes (Dasoudi Campsite) Beach provide facilities and services to bathers. The Campsite includes the only a eucalyptus forest meets the coast in Cyprus. Polis has many bicycle, motorbike and car rental firms to help the tourist explore nearby points of interest. A short distance west of Polis is the harbor of Latchi that once served as a carob shipping port. Today the stone warehouses that once held carob now host restaurants and fish taverns. Latchi offers a municipal beach and water sport facilities where boats can be hired for fishing or deep-sea diving. A short cruise to Akamas departs from Latchi. The entrance to the Akamas countrywide Park at Neo Chorio is a short drive from Polis. 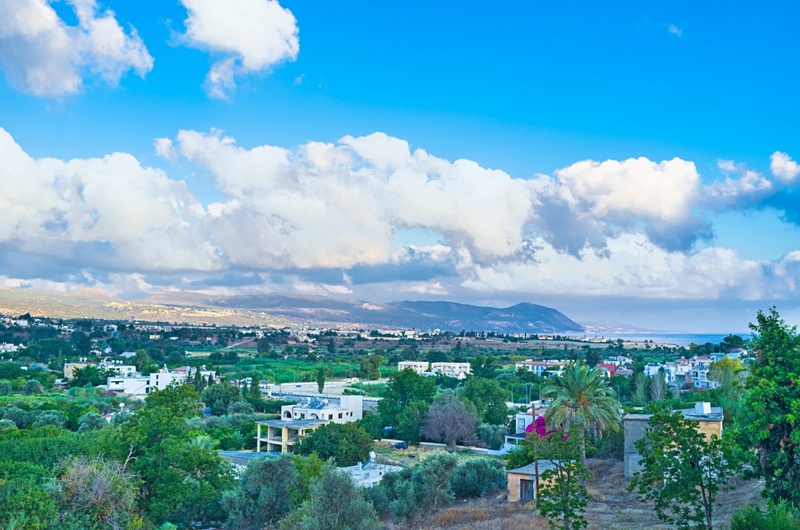 The Akamas Peninsula presents a mosaic of the geological formations of Cyprus that provides unique habitats with Para - Mediterranean ecosystems and unusual biodiversity. There are three popular Akamas nature walks - Aphrodite Trail, Smigies Trail and Pissouromoutti Trail - range in length from 7.5 to 2.5 km and require 1 to 3 hours to complete. Find information about selected Hotels, apartments and rooms in Polis Chrysochous to choose the perfect place for your accommodation.